Reading and share top 15 famous quotes and sayings about Creativity And Life by famous authors and people. 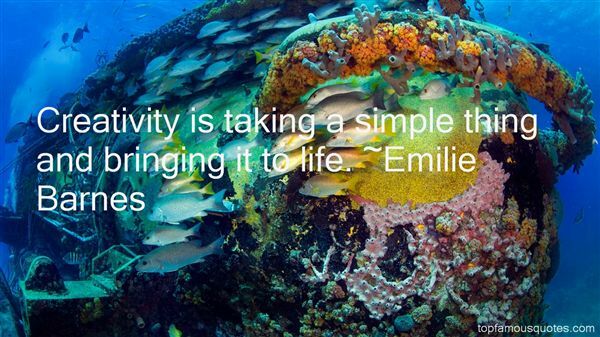 Browse top 15 famous quotes and sayings about Creativity And Life by most favorite authors. 1. "Creativity is a gift each one of us is born with, irrespective of our backgrounds and entitlement of culture, The challenge is to hold onto this gift as we go through life. To nurture it. To encourage it. Because every single day we encounter forces that would rather it went away." 2. "After my kids were born I found myself incorporating my photography into different art endeavors and from there it just blossomed. I have always had to have an outlet for my creativity and when my life became more about raising my family than the bright lights of show business exploring my photo art was a great outlet for me." 3. "From human problems come human solutions, which in turn spawn inspiration, creativity, insight and enlightenment. Without life's problems, life would become stagnant, dull and boring." 4. "When you're socially awkward, you're isolated more than usual, and when you're isolated more than usual, your creativity is less compromised by what has already been said and done. All your hope in life starts to depend on your craft, so you try to perfect it. One reason I stay isolated more than the average person is to keep my creativity as fierce as possible. Being the odd one out may have its temporary disadvantages, but more importantly, it has its permanent advantages." 5. "From the pool of awakenings which includes creativity, strength, generosity, loving-kindness and transformation, I selected seven awakenings to immerse myself in each day: consciousness, compassion, forgiveness, expansion, abundance, healing, and balance. I believe that if we can live a life toward mastery of any seven principles in the pool of awakenings, then our lives will flourish and those we hold dear in our lives will experience greater fulfillment. Which seven do you choose?" 6. "Because IQ tests favor memory skills and logic, overlooking artistic creativity, insight, resiliency, emotional reserves, sensory gifts, and life experience, they can't really predict success, let alone satisfaction." 7. "Creativity is taking a simple thing and bringing it to life." 8. "You are infinite intelligence, creativity and Energy-Consciousness which gives you the power and wisdom to attain fulfillment and completion in life." 9. "I'm a believer in just open, free-form creativity, and you never know the surprises that life has in store, and that, purely on a creative level, there's no such thing as rules." 10. "I watched her with the crab as she ignored all my admonitions that the poor crab just needed to be set free if he was to have any chance of surviving. And God showed up there on that beach to teach me a lesson. Nothing survives when it's being smothered. Life, real life, requires being free to move about in the great big ocean, not being cradled in little hot hands that will stifle independence and creativity. We can't keep our crabs (or our kids) in a bucket and expect them to go far in life." 11. "Creativity keeps the world alive, yet, everyday we are asked to be ashamed of honoring it, wanting to live our lives as artists. i've carried the shame of being a ‘creative' since i came to the planet; have been asked to be something different, more, less my whole life. thank spirit, my wisdom is deeper than my shame, and i listened to who i was. i want to say to all the creatives who have been taught to believe who you are is not enough for this world, taught that a life of art will amount to nothing, know that who we are, and what we do is life. when we create, we are creating the world. remember this, and commit." 12. "India is a land of plenty inhibited by poverty; India has an enthralling, uplifting civilization that sparkles not only in our magnificent art, but also in the enormous creativity and humanity of our daily life in city and village." 13. "Creativity is closely associated with bipolar disorder. This condition is unique . Many famous historical figures and artists have had this. Yet they have led a full life and contributed so much to the society and world at large. See, you have a gift. People with bipolar disorder are very very sensitive. Much more than ordinary people. They are able to experience emotions in a very deep and intense way. It gives them a very different perspective of the world. It is not that they lose touch with reality. But the feelings of extreme intensity are manifested in creative things. They pour their emotions into either writing or whatever field they have chosen" (pg 181)"
14. "Think of those fingers as abilities. A creative person may write, paint, sculpt, or think up math formulae; he or she might dance or sing or play a musical instrument. Those are the fingers, but creativity is the hand that gives them life. 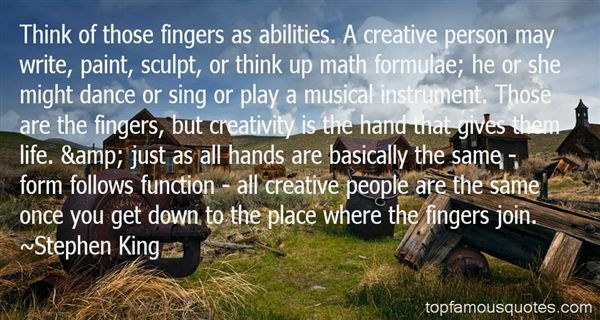 & just as all hands are basically the same - form follows function - all creative people are the same once you get down to the place where the fingers join." 15. "Some might think that the creativity, imagination, and flights of fancy that give my life meaning are insanity." There is moss on the wallsand the stain of thought and failure andwaiting"